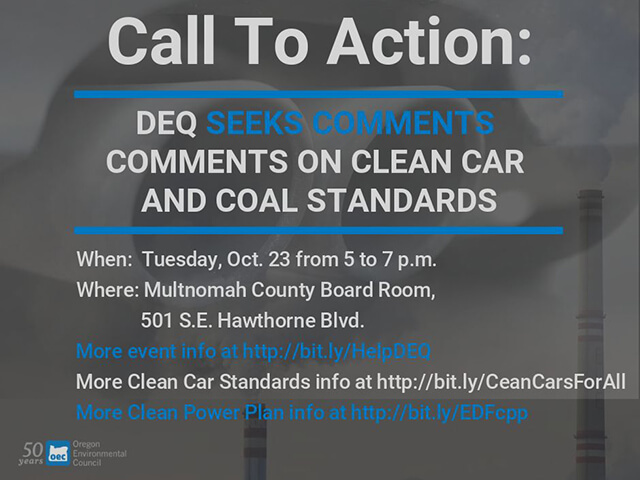 The Oregon Department of Environmental Quality has planned a public forum for residents to comment on the Trump Administration’s proposals to rollback clean car standards and the Clean Power Plan. Coal and cars have been the top two sources of emmissions in the United States. The Obama Administration adopted proposals to cut emissions from these two sectors. The Trump Administration is now rolling them back. Periods for public comment are about to expire, and DEQ will forward messages to the federal agencies before deadlines. Oregon Environmental Council strongly opposes these reversals, and asks that you do too. Clean Car Standards are incredibly important for reducing climate pollution. The change the EPA is proposing would add 11 billion tons of excess greenhouse gas emissions into our atmosphere. The rollbacks are a combination of reducing both fuel economy AND GHG standards. This would mean billions more gallons of petroleum consumed and much greater expense for drivers. More information on their importance here. The Clean Power Plan would have accelerated emissions reductions from coal-fired power plants. This is critical because the power sector is the #2 source of emissions in the US, decarbonizing the grid paves the way for transportation decarbonization, and there are TREMENDOUS health benefits from moving away from fossil fuel use in power plants. More information on the impact to the Trump Administration’s proposal. Please participate in this important public hearing. The Oregon Department of Environmental Quality will provide an opportunity for Oregonians to comment in opposition to changes of standards for national automobile fuel efficiency and greenhouse gas emissions from coal-fired power plants. DEQ will collect and record public comments on the Safer Affordable Fuel Efficient Vehicles Rule and the Affordable Clean Energy Rule and will submit the comments by the respective public comment deadlines. Written and verbal comments will be accepted at the hearing only. When: Tuesday, October 23, 5 to 7 p.m. The hearing is open to the public and will be facilitated by a hearings officer. All comments provided during the hearing will be recorded and submitted to the U.S. EPA by Oregon DEQ. 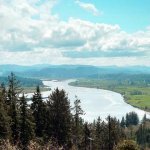 To find out how Oregon has been responding to the onslaught of federal attacks on environmental protections, read OEC’s blog on Governor Brown’s recent announcement to introduce the Oregon Environmental Protection Act to shield our state from federal rollbacks. 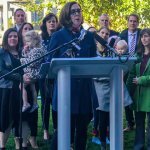 It would put the Clean Air and Water Acts as they existed in January 2017 into Oregon law. No Replies to "A chance to speak up about federal roll backs"